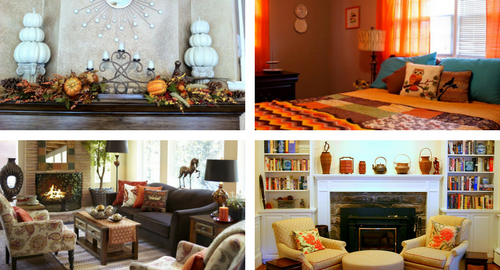 Fall season finally arrive and you might want to add some fall home décor to your house to get the fall atmosphere both indoor and outdoor. With beautiful fall colors your house will feel warmer in the cold and chilly fall season. Furthermore there are a lot of fall items that you could use as decoration around the house, so you would not runs out items to spice up your home. You can try to freshen up your house decoration with several decoration ideas that we have here. It is easy to do and follow so you do not have to worry. If you want to get fall atmosphere right away in your house, then you should also greet your guest with fall decoration right from your front door. Try to create pumpkin front door using a lot of pumpkins in different size. Just pile them on a basket and put them on your front door. You can also put one pumpkin on each size of the steps you had in your front door. For fall home décor creativity you can hollow the pumpkin and put one of your flower pots inside. That way you will get pumpkin flower pot to place in front of your door. Make sure that the flower you use in the pumpkin pot has suitable colors with the pumpkin. Then on the door you can put a fall wreath which you make from arrangement of maple leaves. You can also put the maple leaves around the door when necessary. If you thinking you need to change your sofa to match with the fall theme and color, you could think it over since you do not need to change your sofa just to get the fall atmosphere. What you need to do is to add several items in fall colors on your sofa to get the fall feeling. You could also use fall home décor sofa cover to change the color of your sofa to be fall colored such as orange, brown, dark red and many others. But if you do not like to use sofa cover then you could just throw a blanket with fall color on the back of the sofa to add splash of fall color on it. To complete the sofa, of course you need to use some pillow with fall color. But you do not need to purchase new set of pillow, instead just get a few pillow cover in fall color that would match with the sofa throw or blanket color that you use earlier. If you could find some cover with fall leaves or fall harvest patterns it would be great, but if you could not found it, then just use plain sofa cover as long as the color match with the other fall home décor. Another place to decorate is your fireplace which you will start to use from the beginning of the fall season to the end of the winter season. And to show the season changes, then you can try to decorate your fireplace with fall home décor. As usual you can use a lot of pumpkin in different size as decoration along with several falling leaves or even fall potted plant. You could also add mirror and candle on your fireplace. But if you do not want to be bothered with something too fancy, then you could just put several soil pottery on your fireplace. For fall season, you need to make your bedroom feels warmer, that way it would be more comfortable to use. Try to use fall patterned bedding for example one in orange color or fall leaves pattern. But if you could not find one, then you could use plain bedding in fall colors. Put small creature fall home décor such as owl and squirrel which represent this season all around the room to give some welcoming atmosphere. If you invite several friends for fall dinner, then you should also prepare some fall home décor on your dining room. The first place you should decorate is the room itself since you need to add several splash of fall color on the room. Change the window treatment to fall orange color, tie orange cloth to your dining chair back to add the fall feeling. Then you should try to make fall center dining table piece from pumpkin, candle, or even several flowers. When you want to use fall home décor to your house, you should make sure that you decorate your house thoroughly from the outdoor to the indoor decoration. That is because you need to make sure that the fall theme will be felt all around the house, especially by the guest that you invite to come over to your house.